Works well, and very reasonably priced. Some models have experienced issues - ours was fine though. 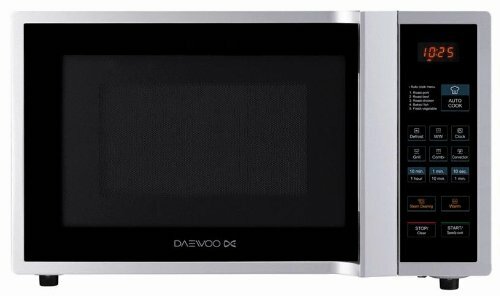 Daewoo are renowned for creating microwaves which offer value for money, with decent specifications at typically lower prices than that of their rival manufacturers. The KOC9Q1T on face value offers a lot of white microwave for your money - it's a combi model, complete with a large 28 litre capacity and 900w of power, all for just over the £120 mark. The interior is finished in stainless steel, which looks smart and has the bonus of being easy to clean. Measuring 56.9 x 43.1 x 36.3 cm, it's not the smallest of appliances - however for a 28 litre capacity this is pretty reasonable. The exterior is finished in white, with large black sections for the window and the controls area. The controls themselves are very well labelled, making operating this microwave extremely easy - we didn't need to consult the handbook at all. The turntable is removable, and made from glass - and as such is easy to clean. The KOC9Q1T also features a steam cleaning facility, making removing any food marks easy. The convection oven features 2700w of power - and works exceedingly well. When in microwave mode it features 10 different power levels and also 5 auto cook menus - saving you time and hassle when cooking popular dishes. Please note: we have heard stories that some of Daewoo's combi microwave models have experienced faults - however we didn't experience this ourselves, and as with all kitchen appliances, this model will come with a warranty should you have any issues. 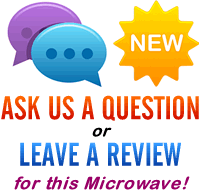 Overall a very good value microwave, providing features of a high end microwave at a very low price.